Funerals are a time when people come together to remember their loved one who has passed away. But along with remembrance, they are also times to celebrate the life of the departed. Organising a funeral party takes skill and restraint - as well as decorations with the right solemnity and elegance. If you have been tasked with planning a wake, or you want to decorate a grave tastefully, you can find all of the elements that you need at SkyLantern Original. In some cultures, death is marked by lighting displays that symbolise the passage of the soul to the afterlife. 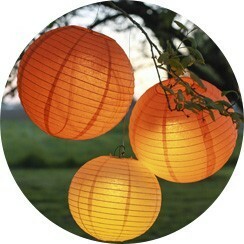 You can create a similar effect by arranging Maya bags around your garden or floating tea lights on water. With a little inspiration, you can design lighting that soothes and relaxes your guests, giving them the perfect place to reflect. Candlelight is another thing that we often associate with remembrance. If you are decorating a funeral ceremony or a gathering after the event, our plain LED lit candles will provide a minimalist, tasteful way to add some beauty to your surroundings. 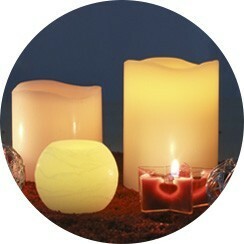 You could also include an area with candles available for guests to make a prayer and an offering to god. 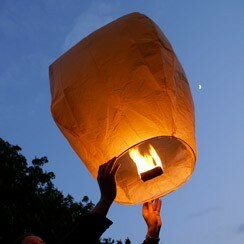 For a different approach, you could also release some of SkyLantern Original's Chinese lanterns. Set the soul of your loved one soaring into the heavens in an inspiring ritual that will help your guests to make their peace. You might ask them to attach a message, giving the spectacle even more meaning. Our lanterns will also take off in seconds, and their LEDs will not be extinguished by the wind. Organising burial decorations or planning a funeral wake can be a stressful task, but all of our decorations are simple to install, making the process much easier. 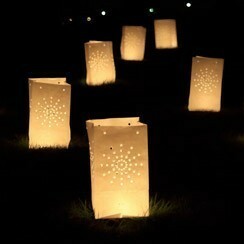 For all of the grave-side decorations and lanterns you need, check out the funeral selection at the SkyLantern Original website.